This article was originally published on October 24, 2011, in the Shenzhen Daily. Some time ago I wrote about the boy emperor Zhao Bing, the "last of the Song Dynasty," whose purported tomb is in Chiwan, Shekou. He drowned in the arms of his loyal retainer, Lu Xiufu, after his forces lost a sea battle against the Yuan. His next older brother, Zhao Shi, also died in the south, in Hong Kong, at the tender age of ten. Like Zhao Bing, he was blessed with the services of an older officer, Yang Liang Jie (Cantonese Yeung Leung-jit) who is better known by his honorary title, Hou Wang (Cantonese Hau Wong). They say Yang stayed behind after the death of Zhao Shi to ensure Zhao Bing's escape. He thus became a local hero, and there are at least eleven temples dedicated to him in Hong Kong. Shenzhen boasts a couple of her own, located oddly near each other. 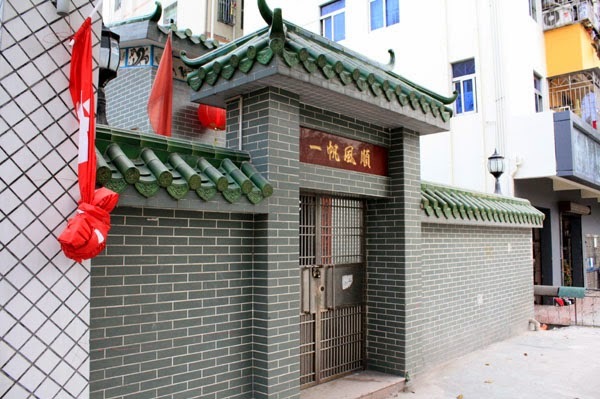 The larger and more interesting is north of Guimiao Road, just east of Qianhai Road in Xiangnan Village, on Da Ban Qiao Xiang. 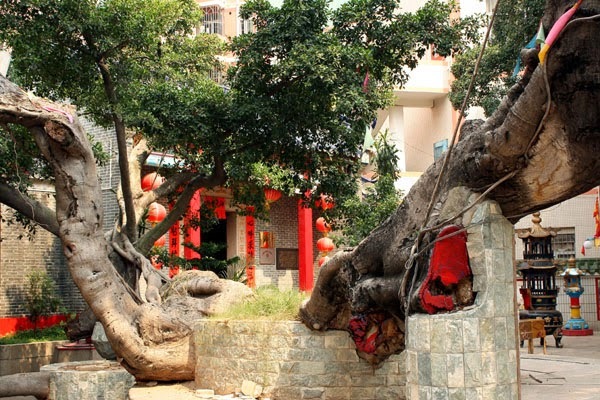 A large tree spreads out just west of the gate. On the grounds are two more ancient ficus trees, 100 and 300 years old respectively. 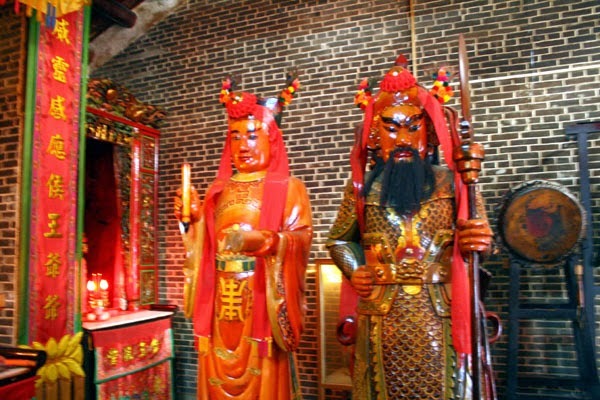 The temple is pleasant enough, with Hou Wang flanked by several other deities. 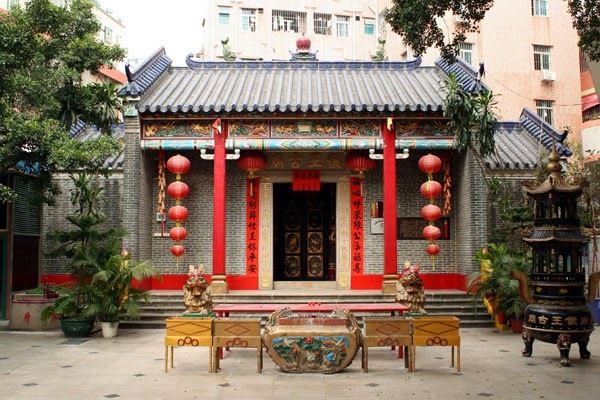 Turning left out of the gate, a few minutes' walk will bring you to a Zheng family ancestral hall. 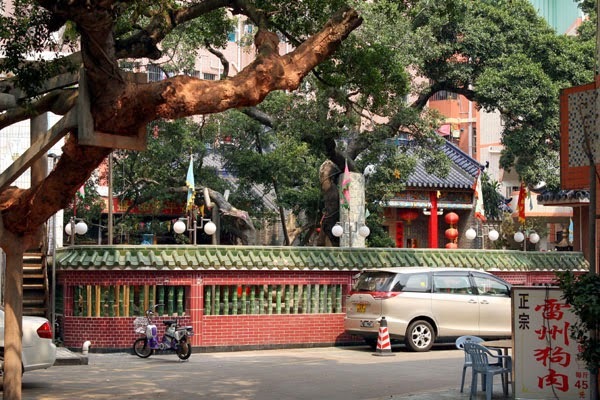 Back to the west, and a little south on Qianhai Road, is the front of another small Hou Wang temple. You'll need to go around the back and seek entry to a building compound to enter this one; only die-hard temple fans would find it worthwhile. There's a Huang family hall further south down the back street.